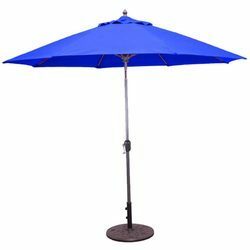 Light in weight and easy to carry, our garden umbrellas provide cool shade and can bear heavy wind. Made from premium standard fabric, these umbrellas are available in a variety of shapes, sizes and colors. 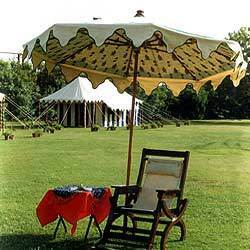 Our exquisite range of Embroidered Garden Umbrella are available in a variety of attractive designs. 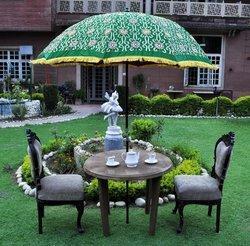 We match these embroidered garden umbrella with innovative color shades that make them attractive to look at. Further these feature handcrafted embroidered designs. 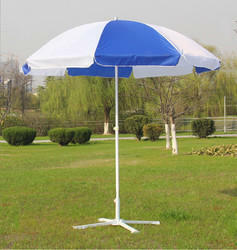 We specialize in the manufacturing of wooden garden umbrella. Their innovative designs make them perfect for garden & resorts. With easily installation features, our wooden garden umbrella matches up with grandeur & décor of the place and can even be manufactured as per customers requirements. We manufacture a range of promotional garden umbrella for our clients. These Promotional Garden Umbrella can be custom manufactured according to the client's needs. The unique design of the side panels benefits from clear windows at the rear for maximum light exposure into the event, blank side panels from right to left for possible advertising space. 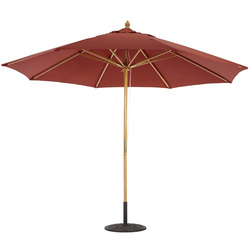 We have been offering a wide range of Garden Umbrellas with wooden frame. These are customized as per the specifications of our clients and are delivered with in the shortest time frame. We have been offering a wide range of outdoor promotional umbrella. These outdoor promotional umbrella are customized as per the specifications of our clients and are delivered with in the shortest time frame. Looking for Garden Umbrella ?